On Good Friday this year we did the Stations of the Cross for the first time in many years at the church. We recited the ancient words of the Trisagion in seven languages. The Trisagion has been called the Thrice Holy: “Holy God, Holy and Mighty, Holy Immortal One, have mercy upon us” When we did that, we didn’t realize how prescient we were. Just a month ago the Bishop asked us to receive an entire congregation into our parish family; a Spanish speaking congregation! We are thrilled, of course, but we are also devoutly aware of the challenges facing us as the language barrier will indeed be real. Then we began preparing for Pentecost, a time when we proclaim the Gospel in as many languages as we can find in our congregation. Again the magic number: seven! And among them is, of course, Spanish. How true to the birthday of the church, when the Spirit alighted upon the heads of the Apostles and they proclaimed the Gospel to all in a language they all understood from the four corners of the earth. As the church in her very birth preached and understood the Gospel of all races, cultures, and ethnicities, so too may we break the barriers that separate humanity by proclaiming the Good News of God to all! In the lesson from Acts, it is amazing that the Pentecost event finds the disciples speaking in foreign languages in such ways as to make the Gospel absolutely clear to all hearers. Listen up! The love of God has broken all barriers between all people. God loves all, forgives all, and gives eternal life to all. It doesn’t get much better than that. God gives to us the ministry of reconciliation so that we all may be one as God and Jesus are one. The phenomenon of glossalalia is not mentioned in the account from Acts, but what is mentioned is that everyone, whatever race, ethnicity or walk of life, clearly understands the message of Jesus because it is proclaimed in terms everyone can understand. It was the birthday of the church, and it grew like wildfire, so hungry were folks then for such a message. 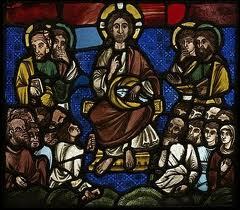 Paul notes that the whole creation had been groaning on under the oppressive yoke of hatred, violence, and alienation. We had lived our whole lives and our whole history as orphaned offspring of every alienated race, culture, and ethnicity under the heavens. And all the gods of all the nations were no help. They fought in heaven as humans fought on earth, and it meant only bloodshed and a hopeless existence for us. Then Jesus came and it all changed. Suddenly we were one again; all those parochial differences fell away at the gaze of God; for in Jesus God is one as all humanity is one. And thus hope was born that first Pentecost. It may have been an unseen hope, but it was no less real. Suddenly God’s love became vividly clear to all and abundantly understood. In the Gospel passage Jesus tells us the Truth; he did not leave us comfortless, but sent the Advocate to lead us into all truth. Imagine: an Advocate with the Father, one who would plead our case to God. It was glorious news to hear. We could not bear the whole truth then at the beginning but eventually we would begin to hear what Jesus has been saying all along; namely that we are all one in Christ and all differences fall before the gaze of God. One wonders how we manage to wander so far away from the Good News. How can it be that we live in a time of ethnic cleansing, of genocide, and of holocaust? How can human hatred become so prevalent? Race has surely been a problematic for this nation in our history. Language has been problematic for Canadians. For the Irish it was our faith itself that became the occasion for death. And now we are plunged into “jihad” and “holy war” as if there is anything “holy” about killing in God’s name. The sorry chronicle of human history has been well documented, and we continue to hold our breath wondering what’s next for our human family. In the biblical narrative from Genesis, it appears that there was a time when we were all of one language and we were indeed all one. Then we got it into our heads that we should build a tower that would reach to the heavens. Did we build this tower as a tribute to God or as a monument to our own glory? Scholars have debated that question and in fact find that the word Babel, in its Sumerian roots, can be rendered “Gate of God”. Whatever the case, these efforts did not please God, and we were driven away and dispersed throughout the corners of the earth and we were rendered confounded in speech. There was a “fall” from an estate of unity to confusion, from trust to suspicion, and from peace to conflict. The rest of our history has been a struggle to return to that beatific state of harmony. Unfortunately there have been many wars in the meantime, much blood has been shed, and we remain woefully suspicious, fearful and disposed toward violence. We have made attempts to rectify this sorry state of affairs. From the founding of Parliament we have sought ways to talk to one another rather than fight. From the League of Nations to the United Nations we have postulated that talk is better than battle. We have little ear pieces given to us by the wonders of technology that makes it possible to understand one another’s speech. But still far too often our conversations break down into rage and recrimination. It was a day of unforgettable grace for humanity then, when the church proclaimed the Gospel in every language. Everyone came to experience that Peace that passes understanding. Jesus greeted his Apostles with the ancient greeting: Peace, Shalom, Salaam. We still greet one another that way in the Middle East. And yet nowhere on earth is Peace so far away. Pentecost was more than a welcome; it was a new birth of hope for humanity. Within the fellowship of the church all humanity would find that the Love of God is absolute, the forgiveness of God covers all human sin, and eternal life is a free gift for all. Best of all, the notion of reconciliation is central to our mission and therefore all humanity is embraced by the arms of God. The singular sign of all this joy was the Pentecost experience. Everyone from all the nations of the earth heard the Good News of Jesus in their own language and they marveled at the church’s grace and power. So now it is up to us. In our case, in the church I serve, we have a brand new Spanish congregation coming to us in a few short weeks. I have been asked how long they will be here. I could not help but ask another question by way of an answer. How would any of us like it if we were told that we were welcome to come to church for a while and then, “if” it worked out we could stay a little longer? In the church there is no “they”. There is only one family; God’s family. By all means there may be an 8 o’clock congregations that has a spoken formal service in Elizabethan English. There may be a more contemporary English language worship service with music at 10, and the Hispanic congregation may meet at noon and they will have a raucous band that rocks our church. But, when it comes to the High Holy Days of the church year, we will be one family worshipping and rejoicing in all languages and cultural idioms. Hopefully we will come to know and love one another as Christ knows and loves us. How wonderful is Pentecost. Jesus told us that there were many things he would teach us that we could not bear at the time. The Good News is that we are beginning to understand what Jesus meant by that. As we watch all the walls that separate humanity fall, so too we see the Spirit of Christ fill the earth with the News of the Gospel. It is a matter of some urgency that we redouble our efforts at proclaiming this news to this broken, sinful and dangerous world. With confidence in God who is the Creator, the Savior and Sanctifier of us all, let us proclaim the nearness of God. We have come full circle from Babel to Pentecost and the Kingdom is at hand! He was educated both at home and by his parish priest whose first name was Lawrence and who was greatly admired by the young Nicholas. He was well read and, from an early age, drawn to a spiritual life of faith and love for God. In the years between the abrupt end of his duties as a soldier and his entry into monastic life, he spent a period of time in the wilderness living like one of the early desert fathers. Also, prior to entering the monastery, he spent some time in private service. In his characteristic, self deprecating way, he mentions that he was a "footman who was clumsy and broke everything". A gentle man of joyful spirit, Brother Lawrence shunned attention and the limelight, knowing that outside distraction "spoils all". It was not until after his death that a few of his letters were collected. Joseph de Beaufort, counsel to the Paris archbishop, first published the letters in a small pamphlet. The following year, in a second publication which he titled, 'The Practice of the Presence of God', de Beaufort included, as introductory material, the content of four conversations he had with Brother Lawrence. Brother Lawrence died in 1691, having practiced God's presence for over forty years. His quiet death was much like his monastic life where each day and each hour was a new beginning and a fresh commitment to love God with all his heart. Introduction: At the time of de Beaufort's interviews, Brother Lawrence was in his late fifties. Joseph de Beaufort later commented that the crippled brother, who was then in charge of the upkeep of over one hundred pairs of sandals, was "rough in appearance but gentle in grace". This comment was originally made by another church official who had taken note of Brother Lawrence's simple and gentle approach to living in God's presence. First Conversation: The first time I saw Brother Lawrence was on the 3rd of August, 1666. He told me that God had done him a singular favor in his conversion at the age of eighteen. During that winter, upon seeing a tree stripped of its leaves and considering that, within a little time, the leaves would be renewed and, after that, the flowers and fruit appear; Brother Lawrence received a high view of the providence and power of God which has never since been effaced from his soul. This view had perfectly set him free from the world and kindled in him such a love for God, that he could not tell whether it had increased in the forty years that he had lived since. Brother Lawrence related that we should establish ourselves in a sense of God's presence by continually conversing with Him. It was a shameful thing to quit His conversation to think of trifles and fooleries. We should feed and nourish our soul with high notions of God which would yield us great joy in being devoted to Him. He said that as far as the miseries and sins he heard of daily in the world, he was so far from wondering at them, that, on the contrary, he was surprised there were not more, considering the malice sinners were capable of. For his part, he prayed for them; but knowing that God could remedy the mischief they did when He pleased, he gave himself no further trouble. At the end of this first conversation Brother Lawrence said that, if my purpose for the visit was to sincerely discuss how to serve God, I might come to him as often as I pleased; and without any fear of being troublesome. If this was not the case, then I ought visit him no more.